Another set of unanimous decisions on these three specimens. Edward and James both came back with answers of A) cormorant (probably double-crested); B) Juvenile herring gull; C) no idea/? 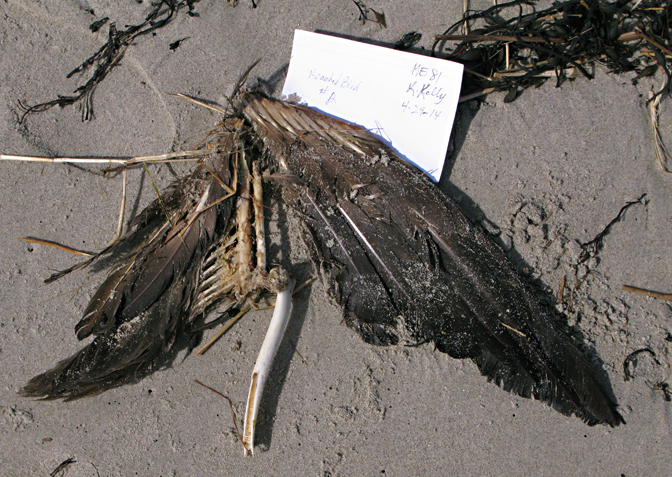 That’s where I came down on these as well, but I wanted to post them because they each illustrate one of the challenges in identifying dead birds, even when the carcass is lovely and intact, as in Bird B. For Bird A, we mainly have the skull, and thus the bill, to go on. The bill is thin, but has a substantial curve, and a prominent hook at the tip. Cormorant does immediately come to mind given these features, but I always try to think “What else could this possibly be?” For Bird A, the only other species group that seemed even remotely possible was the shearwaters. Their bills can have a similar curve and hook. 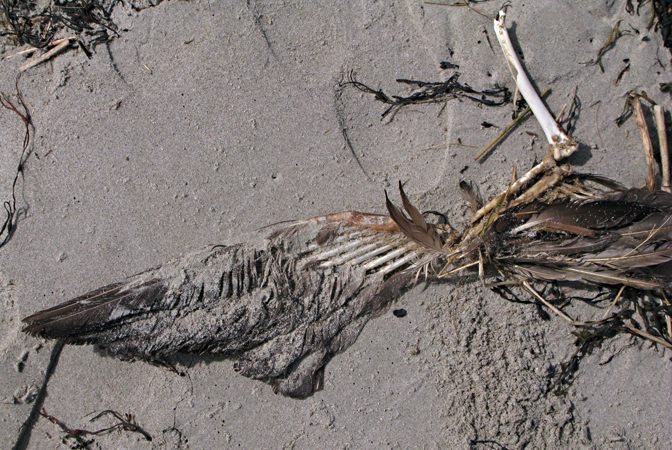 “But wait!” I hear you shriek, “Shearwaters are tubenoses, and I don’t see any tubes on top of that bill!” Well I don’t either, but we must always contend with the possibility that decomposition and general falling apart can alter features rather profoundly. Bird A has lost the keratin sheath that overlies the bones of the bill during life. That sheath sloughs off rather readily as the carcass weathers, and if the tubes on the noses of the tubenoses were only a feature of the bill sheath, and not the underlying bone, then we might indeed see a skull that looks like this. 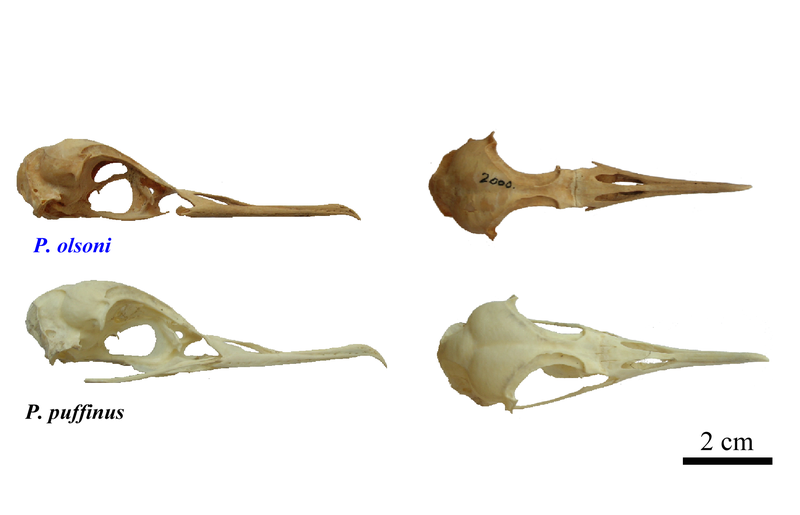 This image of the skulls of both an extinct (top) and extant species of shearwater from a paper by Ramirez et al shows the general features of shearwater skulls when the bill sheath is no longer present. 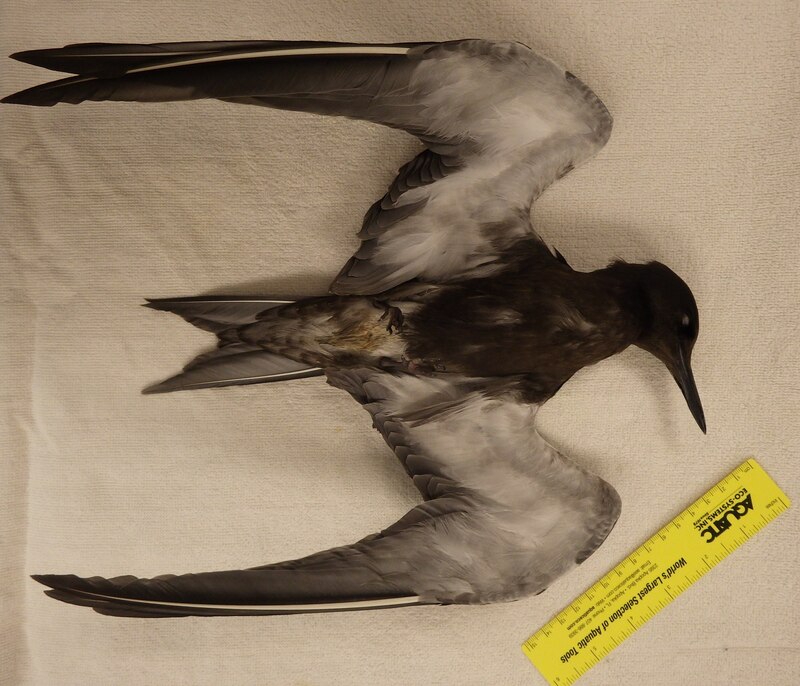 In this photo from the Smithsonian Institution, it’s clear that there is no rise in the bone at the level of the nares as there is in the shearwaters. In fact, it’s hard to really see the nares all that much at all here. This is a feature of pouchbills like cormorants and gannets; in fact, they lack external nares entirely. We who handle the birds live must always pay attention to how we restrain the bill since, if we hold the bill closed entirely, the bird has no way to breathe. All this explanation is really just to tell you what you all apparently already knew: Bird A is a cormorant. It’s difficult to say which species, since an accurate culmen length relies on the bill sheath being intact and seeing where it meets the feathers or facial skin. Not possible here, for obvious reasons. Based on their ubiquity, and the overall shape of the skull, Double-crested is the more likely. Bird B was beautifully intact, so it may seem strange that I used it here as a challenge. But there were features on this carcass that I think could throw some people off. Everyone concurs that this is a juvenile Herring Gull. Indeed, there are many features that would lead us there: the overall gray over the belly and underwings are characteristics of young Herring Gulls that differ from Great Black-backed, Ring-billed, and Laughing Gulls, the three most likely alternatives. So why not just call this a Herring Gull and move on? The color of the legs and the color of the mantle (the back between the wings) caught my eye in this bird. The legs look reddish to me, which makes me think of Laughing Gulls as they have reddish black legs as adults. Our Bird B also has quite a distinct brown pattern to the mantle, where most of the juvenile Herring Gulls we see have more of a grayish wash. The Larusology blog does a good job helping people identify gulls, and this post about Herring vs. Thayer’s gulls points out that this phase is a normal one in young gulls–the feathers over the mantle are large and have a scaled appearance, while the wings have a smaller pattern that looks more checkered, very much like our Bird B. 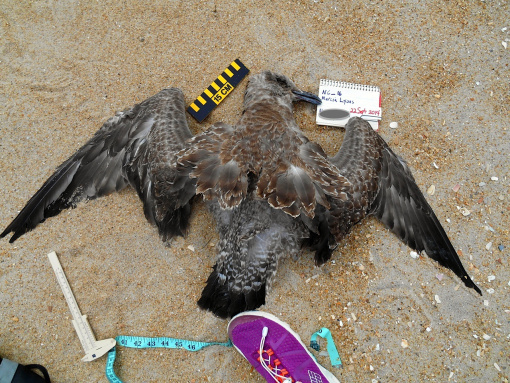 Overall, the weight of the evidence falls on the side of Herring Gull, especially the conspicuous features like the color of the rump at the tail base. In young Herring Gulls, this is dark, where in Laughing Gulls, Ring-billed and Black-backeds, it’s white. None of those species have this much gray and brown over the entire breast, belly, and under the tail. So we’re left with that strange reddish color to the legs. My only guess is that they usual pinkish color has been altered by some trick of the light in combination with the effects of desiccation. In any case, this bird didn’t fool anyone, apparently, and really only had me wondering what was up with it. I’m always hoping to find some weird gull hybrid too, so maybe I see oddities where they are not actually present. Finally, for Bird C, I agree with our respondents: no way to tell from what we have, which is a rather shredded wing missing a bunch of its coverts. “Unknown bird” it is. You can’t win ’em all. 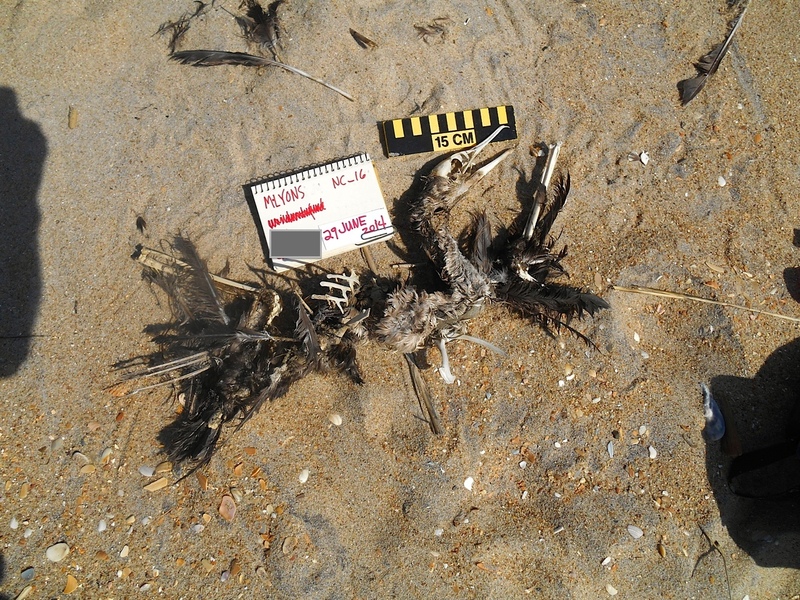 Bird A was found by Marcia Lyons in North Carolina in June. Culmen is reported at 63mm. Other measurements not obtainable due to carcass condition. Bird B is also a Marcia Lyons find, this one from just yesterday. Reported measurements are: Culmen: 61mm; Tarsus: 71mm; Wing chord: 45cm. Bird C is mere shadow of its former self. More specifically, just a wing of its former self. The specimen was found by Kathleen Kelly in Maine back in April. Wing chord reported at 31cm. Is wind power bad for birds? First off, the topic of birds and wind power is far too broad for my poor capacity here on this blog. The issues involved in land based wind farms are different from ocean based ones, and wind turbines affect different species of birds differently. This is not to mention the additional suite of circumstances around wind turbines and their effects on bats. I can’t cover it all. 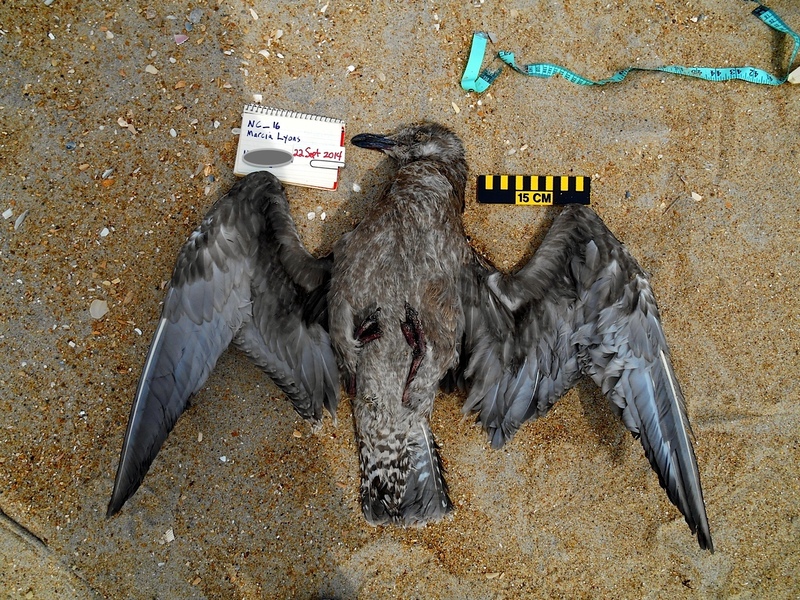 So, since this is the SEANET blog, I elected to restrict myself mainly to an investigation of the impact of ocean-based wind power on seabirds. That’s in itself a broad topic, but here goes. 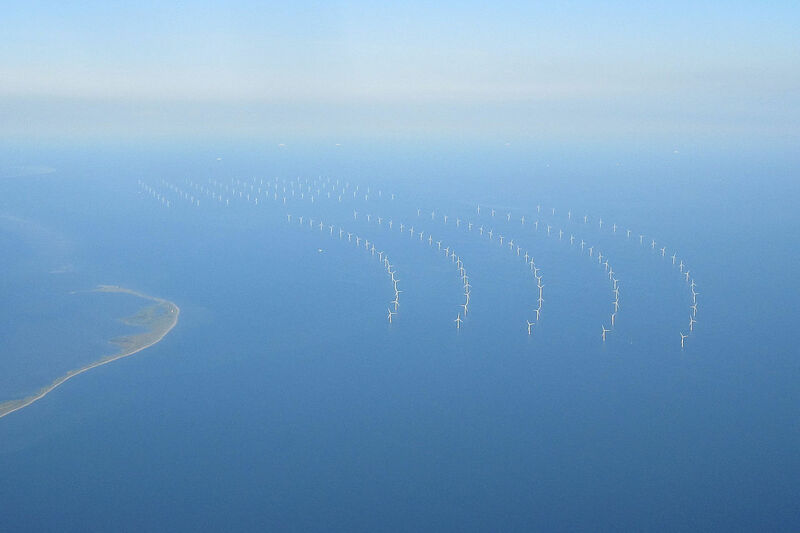 A wind farm off the shore of Denmark. (Photo by Koppelius). 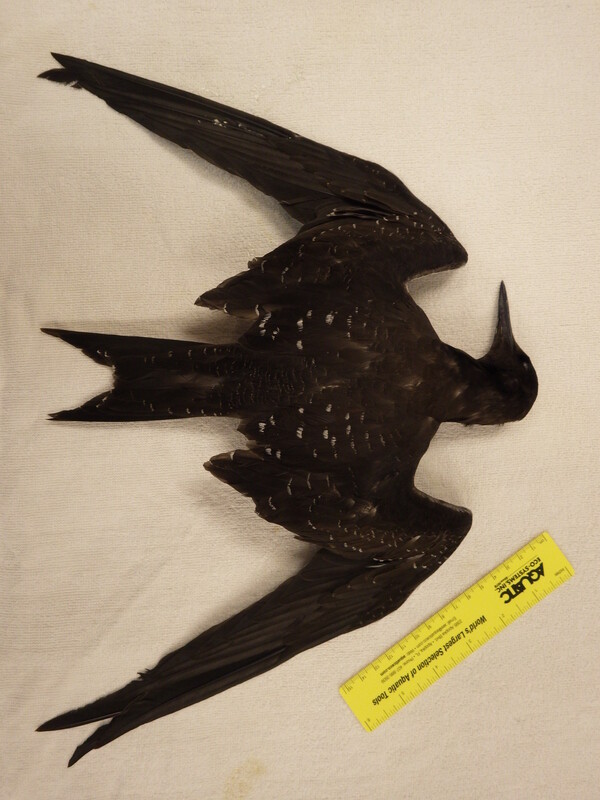 Wind farms can kill or harm birds in more ways than one might expect. There is the obvious and violent spectacle of birds killed due to direct flight into the turbine blades or the support structure. But there are subtler impacts as well. While the wind farm is being constructed, birds will be displaced substantially from that location by all the activity. Once construction is complete, the human presence is much reduced, but the turbines themselves alter the seascape from ocean floor to the tip of the tallest blade. The footings and pylons holding up the turbine disrupt and reduce the area of ocean floor and water column available for foraging, and birds may well steer clear of an extended area around the farms. If that area was a rich hunting ground, then the birds will suffer for its loss. How much? Depends on the wind farm, depends on the bird, depends on the prey. Up above the water’s surface, in addition to birds that are killed outright by the turbine blades, there are the birds that instead fly around them and pass by safely. But how far around do they fly? If, for instance, on a migration, a flock of birds gives a wind farm a very wide berth, they will have to increase their energy use for the extra flight time. That demands extra foraging to make up the lost calories. For some species where survival is on the slimmest of margins energetically, might this tip the balance? While there are currently no offshore wind farms in the United States, Europe, led by Germany and its much touted Energiewende, have been investing heavily in such farms, and this gives us an ever increasing body of scientific literature on the observed impacts at real-life sites. Here in the U.S. many scientists have been using mathematical models to game out what impacts wind farms of various sizes, heights, and locations might have. Taken together, we gain ever more insight into how to sensibly and responsibly navigate the way toward cleaner energy sources. Pulling out just a few papers, it becomes clear how unclear the answers become when we try to group even all seabirds together and assess risk. 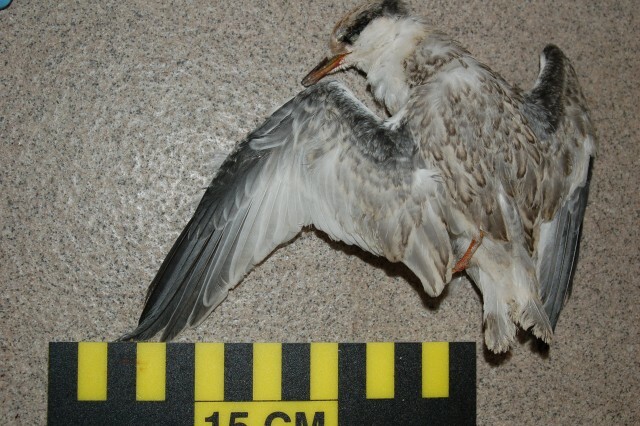 Collisions with turbines are fairly rare in seabirds overall, and especially in comparison to some nocturnally migrating songbirds, for instance. Many water birds actively avoid the turbines, flying above or below the blades, or around the entire farm. A 2012 study using radar detection of migrating pink-footed geese found that 94.25% of all flocks identified flew safely around the farm. Other species, however, are less successful in avoidance; a 2013 study in Scotland identified gulls, gannets and skuas as being at higher risk for collisions, and white-tailed eagles appeared to show little to no avoidance behavior. As to the issue of loss of foraging grounds, the impacts will vary from species to species. By way of example, however, I can offer up the Black Scoter, and a study out in January from researchers in Rhode Island. This paper points out that while many species of seabirds will avoid a newly built wind farm, they will often begin to return to forage in the area after three years or so. It seems that many birds are able to acclimate to the presence of the turbines. A similar phenomenon has been observed at land based farms, where mortality from collisions declines over time as the birds learn that the turbines are there and adjust their flight patterns accordingly. In a species group that tends to be very long-lived, like seabirds, we could certainly anticipate that the knowledge a bird gains about where the farms are and how to work around them, once acquired, would continue to serve that bird over its potential decades of life. An aggregation of scoters. (Photo: Kevin T. Karlson). Figure from the Winiarski, et al paper on marine spatial planning. On the left side are maps of the Block Island area showing the relative importance of the habitat to scoters. The darker the area, the more critical the habitat to bird survival. Darker areas are classed therefore as “priority habitat.” On the right side are graphs showing various species or species groups and how they are projected to decline based on how much of their habitat has been made inaccessible to them. Eventually, if you left zero habitat at all, there would be no birds left because they have no place to be. But up to that point, removing habitat will affect different species differently. The longer the colored line remains level, the more resilient that species is to loss of habitat, possibly because that species is flexible in its habitat use and can shift somewhere else. Other species with a more even distribution decline steadily as soon as habitat begins to become unavailable. Moving down the figure, and looking at b) and c), we can see areas on the map that have been whited out completely. This is a simulated wind farm, and the model treats it as a total loss in terms of habitat. If a wind farm were sited there, we can look at the line graph and see some subtle shifts. Most notable in b): the reddish line representing Common Loons drops off quickly before leveling off somewhat. This indicates that the habitat chunk removed just west of Block Island is a particularly important one for loons. The change is c) is even more striking. 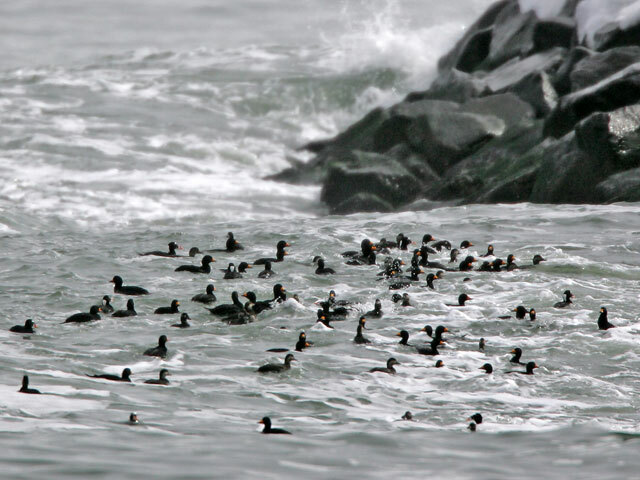 There, the removal of a different piece of habitat to the southwest of Block Island causes a precipitous drop in the distribution of scoters, indicating that that area is of significant importance to their population. By manipulating these models, the scientists can come up with sites that we can expect will do the least harm. 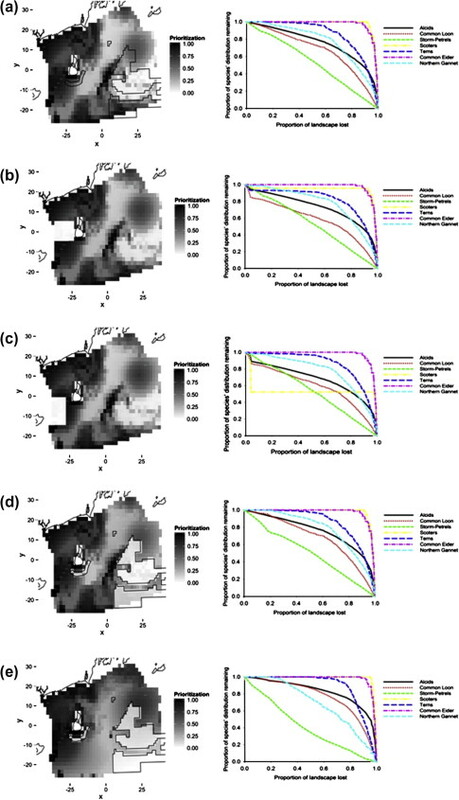 When habitat farther offshore, with fewer of the characteristics sought by seabirds, is removed in a simulated development project, the impacts on the birds are reduced. Such areas, shown in light gray in d) and e), would be better places for a wind farm, for the birds at least. For Rhode Island, the planning map thus recommends that wind farms not be sited within five kilometers of shore, or in waters less than 20 meters deep. The key point of marine spatial planning is the planning. The creators of these maps and documents and guidelines realize that we need cleaner energy, and ocean-based wind is a huge potential source. By choosing the right location, we can also mitigate the risks to wild birds. Just like a LEED-certified, net zero office building is far superior to a conventional building in terms of sustainability, it would be irresponsible folly to construct it in the middle of a wetland housing the last population of a critically endangered species. We need clean energy, and we need to find the right places to get it. To the question of whether or not we should be building wind farms at all, knowing they kill individual birds and pose some level of threat to the population, we must look at the alternatives. The fact is, we need power. The question is, where are we going to get it in the future. 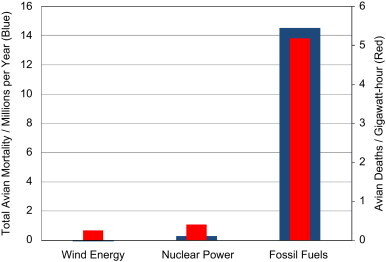 A 2009 analysis by Benjamin Sovacool sought to quantify how many birds are killed per kilowatt-hour of energy produced by various types of power, from fossil fuels, to nuclear, to wind. Some critics of wind power have pointed out that the reason so few birds are killed by wind turbines each year in the United States is solely because we have so few wind turbines. Scale up the technology, they argue, and the numbers of birds killed will skyrocket. Sovacool attempted to neutralize this factor by calculating not total mortality, but mortality per kWh, extrapolating out to an energy future where wind power is supplying far more of the grid. Figure from Sovakool (2009). Blue shows annual avian mortality from each power source, and red shows mortality per gigawatt-hour of electricity generated. Though his exact numbers have been challenged, and I agree with some of the critiques of his techniques and summation, his fundamental idea is sound. When we look at the entire fuel cycle of, say, coal versus wind power, we will come down on the side of wind being substantially more bird friendly. Sovacool points out that mining coal or drilling for oil destroys habitat for birds. Of course, building wind turbines does also. The most egregious methods of extraction, like mountaintop removal for coal, are the opposite of the kind of reasoned, strategic approach seen in a marine spatial plan. But turbines do disrupt habitat as well. Then comes the generation of power. Fossil fuel plants themselves kill large numbers of birds through collisions with their cooling towers and other structures, just as birds collide with cell phone towers and skyscrapers. Build something up into the air, and birds will hit it. An estimated 175 million birds are killed annually in collisions with transmission lines feeding the plants themselves. This issue of power lines remains for wind power too, of course; we have to move the power around and distribute it after all. So by some measures, it seems that the different power sources have similar liabilities in terms of avian mortality. Add in, however, the mercury and the acid-rain producing compounds that enter the atmosphere through the burning of fossil fuels, and the balance shifts to favor wind power. But even if we judged them equal up to that point, we’ve left out the greatest existential threat of them all: climate change. Whereas some species are more affected by wind turbines than others, it’s almost impossible to find a bird species that will be unaffected by climate change, and for some, it will spell extinction. Sovacool also points to all the other anthropogenic causes of bird mortality: an estimated 100 million to domestic cats, 100-900 million dead by collisions with windows. “However,” he writes, “since house cats and office windows do not yet produce electricity, the comparisons are less relevant than those that assess avian deaths from other sources of electricity generation.” Less relevant to questions of our power supply, true, but the comparison is still useful. House cats are not inherently evil (though I know people who will argue that point), nor are office windows. House cats safely indoors are lovely pets to have. House cats hunting outside are a menace. Office windows are nice to gaze out of. Office windows illuminated at night when throngs of nocturnally migrating songbirds are passing through that exact geographic corridor are a killing field. Yet we see scant efforts at legislation to block new construction of office buildings, or even legislation to make windows in new construction less hazardous to birds. I don’t see legislation aimed at keeping house cats indoors either, and it’s not as if having a cat outside does us some essential service, as if it were a public utility. The fact is that knee jerk opposition to wind power on the basis that some birds will be killed by wind farms is not credible scientifically. Birds die by our actions in droves. We are always making the cost-benefit analysis of using cars, living in buildings, having cell phones and many other things that kill a lot of birds. We have the science on how to intelligently site these projects. We can put them where they will do the least harm to birds, knowing that the shift from fossil fuels to wind is, in itself, a benefit to birds. Not to an individual bird killed by a turbine, I’ll grant you that. But we are in the business of the population level threats. And those don’t get any bigger than our continued reluctance to shift to renewable energy. 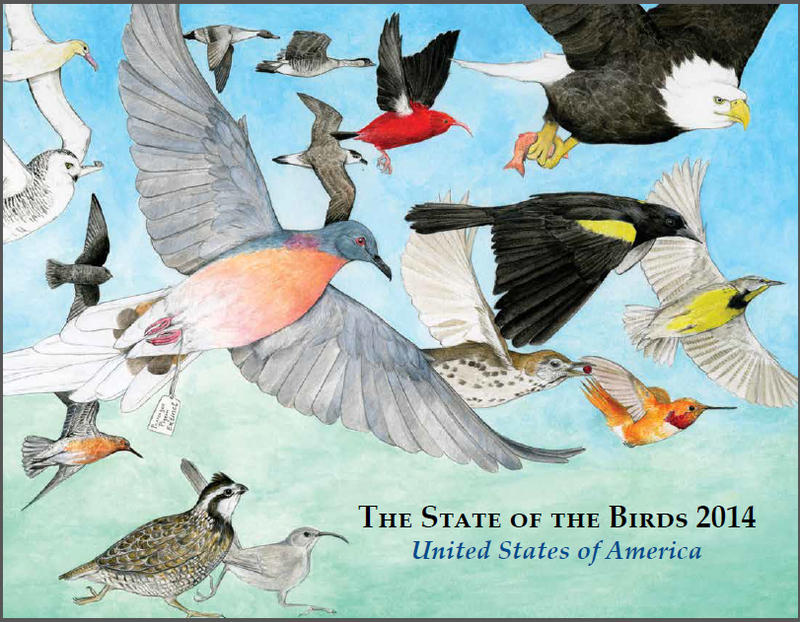 State of the Birds report is out! The North American Bird Conservation Initiative is out with their annual “State of the Birds” report, and I know it will be of interest to you, my dear readers. 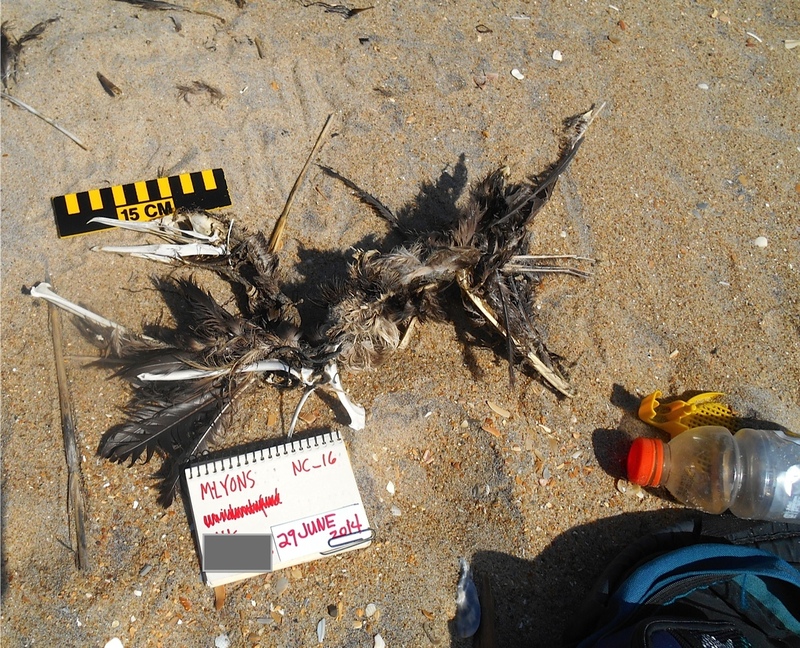 The report covers birds ranging across all sorts of habitats, not just the seabirds we know and love (and seek dead on the beaches of the east coast). There is info here on the trends in western and eastern forests (I found it particularly interesting that while 84% of eastern forest is privately owned, western forests tend to be public lands, and thus, the management stratgies differ substantially); arid grasslands and deserts; shores; oceans and islands. The report is written for the lay person, and I encourage you to check it out and spread it around. I was surprised to learn that the Farm Bill’s conservation initiatives are the big driver of preservation of many grassland species, and I was less surprised to see that outdoor cats kill more birds (by far) in the U.S. every year than all the other human-made causes. Sometimes, we are made to feel like shrill killjoys when we counsel people to keep their cats inside. It can help to have that sky high bar on a graph to point to when making those arguments. For our seabirds, the threats are a bit different. The usual suspects (fishing practices that entangle albatrosses, introduced species decimating island breeding birds) make their usual appearances in the threats list. The report also mentions offshore power development, including not just fossil fuel drilling, but also offshore wind projects as potential threats. This intrigued me as I have not seen persuasive science indicating that offshore wind farms are a population level threat to birds. It’s particularly important to sort out the science here since arguably the gravest threat to seabirds is climate change. Shifts in prey base, ocean temperature and current alterations, and rising sea level threatening to swamp breeding islands all put pressure on these species. Wind power is a partial answer to the problem of global climate change, so we need to run the cost-benefit analysis on this carefully. Perhaps I will make this a little research project of mine and bring you what I can find for science on the subject. In the interim, do check out the report, even if just in appreciation of that lovely cover art. Not only did I get FOUR responses on this latest quiz, but all four respondents were in full agreement and concord on what these specimens were. This might well be a first. While I love a good debate, I also love feeling like our database identifications are being backed up in quadruplicate. John, Wouter, James, and Edward all submitted Common Tern, Common Loon (Edward using the European name that I adore, “Great Northern Diver”), and Sooty Tern (juvenile) for our candidates. I am not always strongest on tern i.d. in particular, so I was especially happy to see my suspicion that Bird A was a COTE fledgling had been backed up by very smart and experienced people. That still does not, however, discharge my responsibility to explain how we reached these i.d.’s. Let us begin with Bird A.
It’s a tern, certainly, and so we need to note the features that can help us differentiate terns. We’ll leave aside measurements for now, though size is a big factor in making the i.d., and look at appearance. This bird has a pale, orangish bill with a darker tip, a dark cap, pinkish legs, and a scalloped pattern over the mantle with a darker black bar running over the mid wing. The tail is moderately forked, I would say, with a thin black line running along the outside edge of the outermost tail feathers. That scalloping on the back suggests that this bird is a youngster, hatched this summer. The possibilities that came to my mind given at least some of those features were Common Tern (COTE) and Least Tern (LETE) juveniles. Young birds can be particularly tricky as they acquire adult characteristics gradually. A feature like the depth of the tail fork, for instance, that would be of considerable use in an adult, can be difficult to judge in juveniles. We can presume, at least, that the depth of the tail fork in our Bird A has not achieved its ultimate, adult appearance. The presence of the dark lines running along the outside of the tail, however, is useful. This feature is present in adult COTE, but not in LETE. The leg color can also be useful. While adult COTE have either black or reddish legs (depending on season), very young birds have pale orange or pinkish legs. LETE, on the other hand, have more yellowish legs when very young. COTE fledglings also have a more complete black cap than LETE of similar age, which I can persuade myself is the case for Bird A. Finally, when we add in the measurements, this bird is a good deal larger than a LETE would be. Putting all this together, my vote was for COTE, and it seems you folks agree. Any other characteristics you found useful in making this call, dear readers? 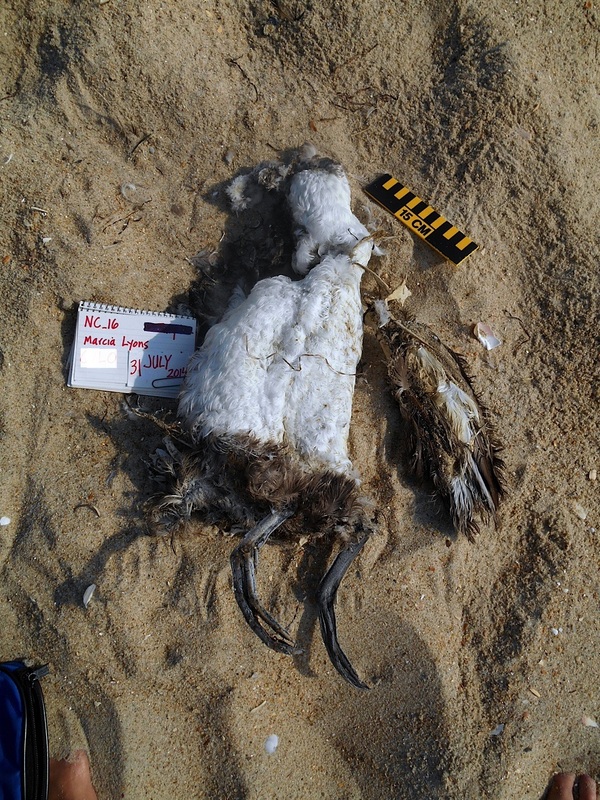 For Bird B, despite the degraded state of this carcass, it was clear to our respondents that this was a Common Loon. This specimen drives home the point that in many cases, an i.d. can be made based on the feet alone. Loon legs are distinctive in their side-to-side flatness, and adding in the tarsus length, we know this is a large loon, telling us we have a Common, rather than a Red-throated Loon here. A nice simple one. 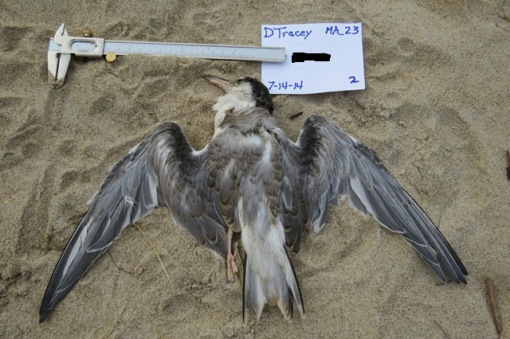 Bird C was also fairly simple–this is a juvenile Sooty Tern. I mainly included this one because it is a good example of how birds turn up dead at just the wrong time. 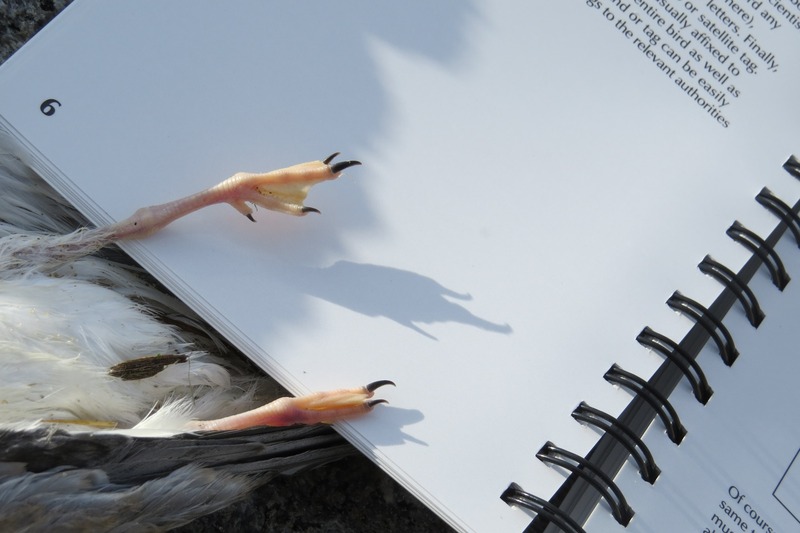 We are going to press now with our Field Guide to Beached Birds of the Southeastern United States, and this bird, with the fine pics taken by my friend Emily, waited to die until it could not possibly be included in that volume. Next edition, to be sure. 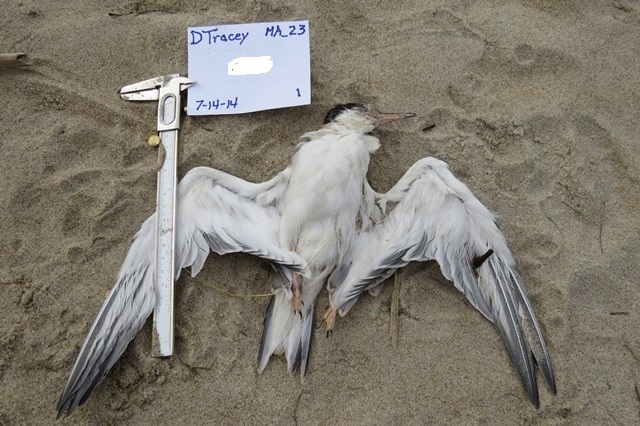 These photos also demonstrate the proper dead bird photo technique–spread wings, head in profile. There are few species this might be confused with, but the field marks that I find of particular use when, say, only the wings are present, are those white spangles over the upper wing, and the contrasting whiteness of the underwing. Thanks to all for playing! Bird A was found by Dan Tracey in northern Massachusetts. Very nice photos, especially that one of those diminutive little feet! This bird had a reported wing chord of 21cm, culmen 30mm, and tarsus 26mm. Bird B was found by Marcia Lyons in NC. The bird has a reported wing chord of 27cm and a tarsus of 88mm. It had no head, and thus, no measurable culmen. Thank you for your forbearance during my shockingly long break from blogging. Vacation was a big part of it, but I also finished the Field Guide to Beached Birds of the Southeastern United States (in the hands of the printer right now!) and I also started a new job, which has caught me up in a whirlwind of activity. I am just now beginning as an Assistant Professor in the Natural Sciences Department at Northern Essex Community College in Massachusetts. It’s where my mother got both her associate’s degree and her nursing degree, and several of my relatives are current students, so already, it feels like home. 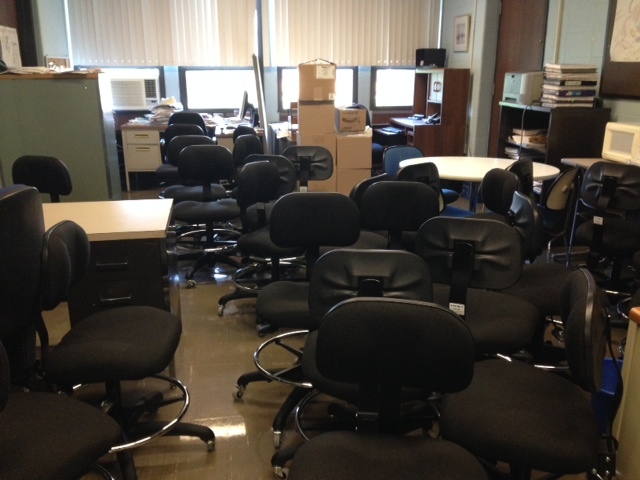 For some reason, many chairs are being stored in the office I share. I want to assure you that I plan to continue my direction of SEANET, and I will back in tip top blogging form starting now. I expect to be able to maintain my (sometimes inadequate) level of attention to SEANET even with my now full time teaching responsibilities. I hope you will continue to bear with me, and thanks for your patience over the years! 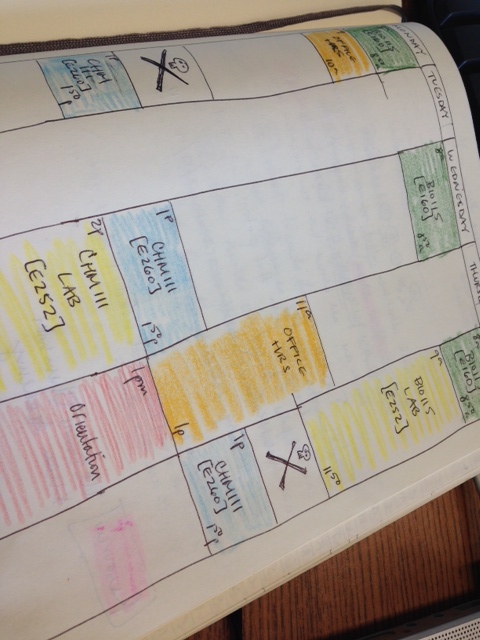 Just like my student days, making out my class schedule.